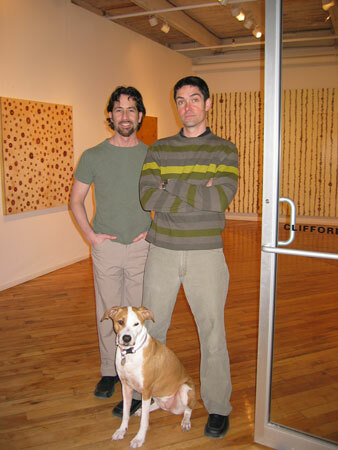 Jim Smith and Rob Clifford, of Clifford • Smith Gallery, have announced that at the end of this month they will close the South End exhibition space they have operated since 1998. Citing the struggles of operating a commercial gallery dealing in art which is conceptually off the beaten path in Boston, the pair have indicated that they are developing a new model with which they hope to combine their skills for curating thought-provoking solo and group shows, with a lower price-point retail component. In the meantime they plan to remain active in the vibrant regional art community they have come to know. Clifford • Smith Gallery opened its doors in May of 1998 on Harrison Avenue, joining pioneer galleries like Genovese/Sullivan, and Kingston Gallery, both of which had recently moved to the South End. They quickly built a reputation as a place to see finely executed, conceptually strong contemporary art, and over the years helped to establish the South End as a destination for any art enthusiast who hoped to find cutting-edge visual art in Boston. Clifford and Smith specialized in exhibiting work that explores experimental media or non-traditional uses of familiar materials. The debut exhibition in the space featured Los Angeles-based installation artist Karen Kimmel’s slickly-produced, acrylic sculptural pieces hanging in one room, and New York artist Larry Krone’s achy-breaky melancholy multimedia installation in the other; one noteworthy piece consisting of the entire lyric to Jimmy Buffett’s Margaritaville spelled out in the artist’s own hair. The small group gathered at that first opening reception – mostly the families and friends of the new gallerists – was treated to Krone’s rendition of Dolly Parton’s Coat Of Many Colors, the artist sitting atop a bale of hay and accompanying himself on the ukulele. This pairing of divergent but complimentary artists’ bodies of work became the first in a program of strong work by talented artists that Clifford•Smith Gallery would come to be known for. In the late 90’s, other than neighbors such as the Pine Street Inn, the gallery building populated by artists and owned by GTI Properties was surrounded by empty lots and abandoned buildings. GTI supported the young galleries’ efforts to promote the neighborhood and to attract other galleries. Over the years, Clifford•Smith Gallery gladly acted as poster-child and eventually were joined by, and inspired by galleries that opened such as O•H+T, Allston Skirt, Bernard Toale, Gallery Katz, Open Studios Press and Samson Projects. Clifford•Smith Gallery’s curatorial aesthetic continued to define itself, and the exhibition program gained a large audience thanks in no small way to the press which was devoted to covering the range of exhibitions that were popping up in the South End. Mainstream media and art world publications wrote regularly about the artists who showed at Clifford•Smith, from the local and supportive papers like South End News, to cultural weeklies such as The Weekly Dig and The Boston Phoenix, to regional favorites like the Boston Globe and Art New England, and international publications such as Art Forum, Art In America, Tema Celeste and Art on Paper. In recent years thoughtful and insightful reviews have also appeared in online sites like bigredandshiny.com and someothermagazine.com. The culmination of this sort of endorsement came in the form of two awards for gallery shows in 2004, including one for Best Solo Exhibition and another for Best Group Exhibition at a Commercial Gallery, awarded by the Boston chapter of the International Association of Art Critics (Association Internationale des Critiques d’Art). Smith and Clifford never restricted themselves by limiting their roster to only local artists, or only artists hailing from outside of the area. Rather, they enjoyed the process of juxtaposing locally-based artists’ work with that of their peers from around the country, and in bringing work that fit the gallery’s aesthetic to Boston from other regions. The dialogue between these artists and their work, sometimes influenced by the artist’s surroundings, interested the duo far more than focusing where the work was produced. Over the years the gallerists did work with––and become friends with––emerging and mid-career artists from around the country. Many of these artists were former students or faculty from the great academic programs around New England like the School of the Museum of Fine Arts, Massachusetts College of Art, Montserrat, Yale, and Bard, to name a few. The curators, staff and administrators at those institutions also became friends of the gallery, as did their peers from the Institute of Contemporary Art, MIT’s List Visual Arts Center, the Worcester Art Museum, the DeCordova Museum, the Fogg Museum, the Museum of Fine Arts, and the Isabella Stewart Gardner Museum, all of whom frequented the space to stay abreast of what was happening in the contemporary art scene in Boston and beyond.